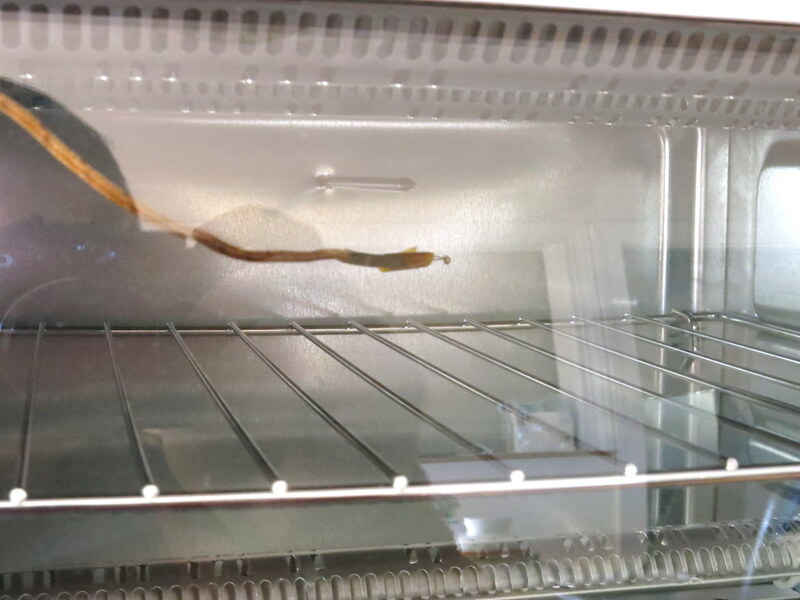 A reflow oven comes in handy when you work regularly with SMT circuits. I’ve had the T-962A reflow oven for about a year now. While it has worked reasonably well, recently it has started showing some signs of aging. 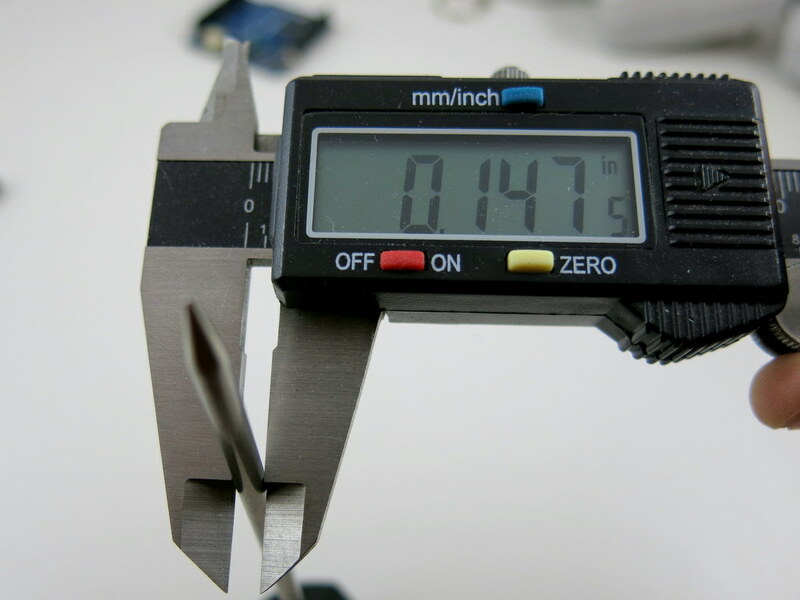 First of all, the total reflow time is quite long, about 15-16 minutes. This is really slow. 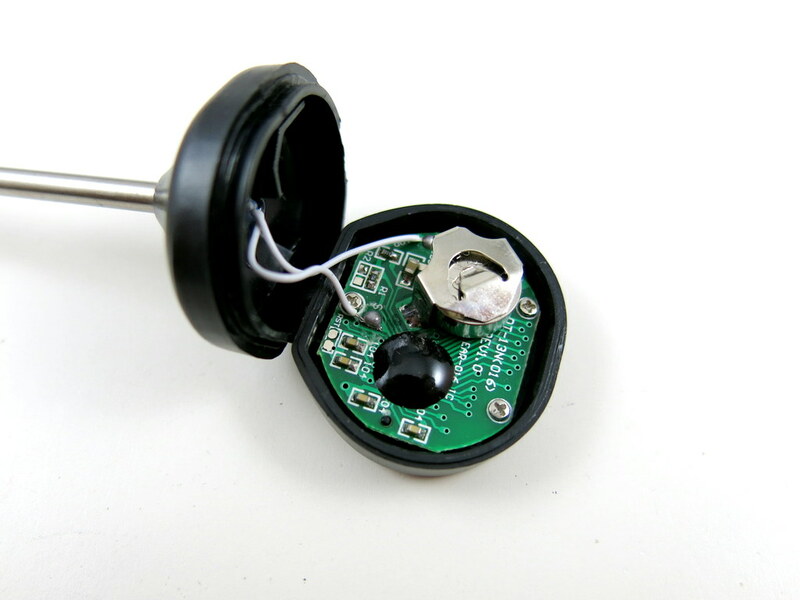 Worse even, occasionally the internal temperature sensor would have a hiccup and the boards would come out under-heated or over-heated. Also, I hate the built-in buzzer, which produces a very loud, high-pitched beep when reflow is completed. This is very annoying — since I keep the reflow oven outdoors, I didn’t want my neighbors to think the beep is my fire alarm. So it’s time to find an alternative / backup solution. 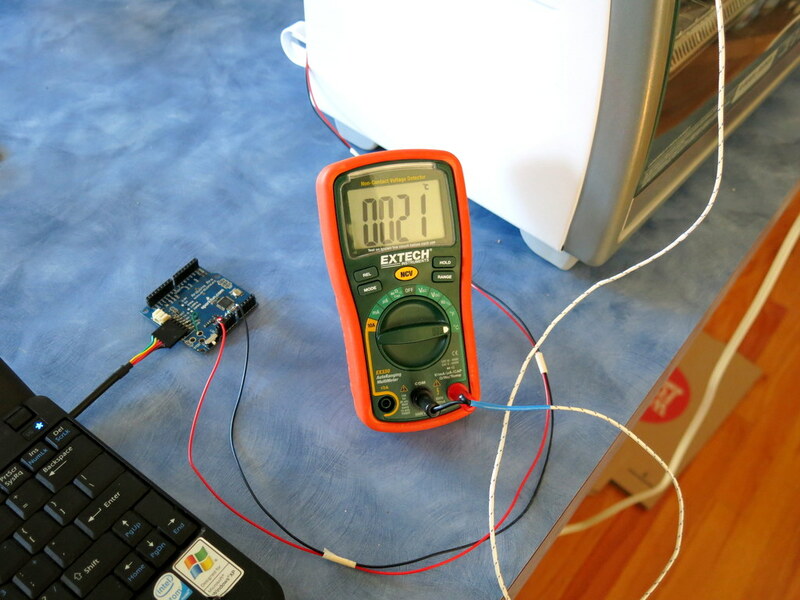 After some online research, I’ve decided to build a reflow toaster oven using an Arduino-based controller. 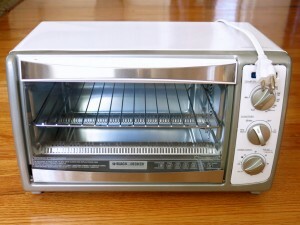 Toaster oven is cheap and provides better, more even heating than a hot skillet. 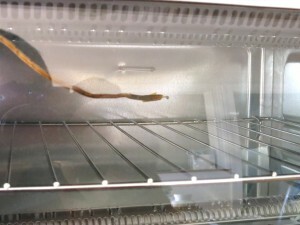 I know toaster oven reflowing has been blogged about everywhere, but I do want to give my version some bells and whistles to provide more convenience. For example, I typically keep the reflow oven outdoors on my porch while working in the basement. So I’d like to receive a remote notification when reflow is complete (no loud beep please!). 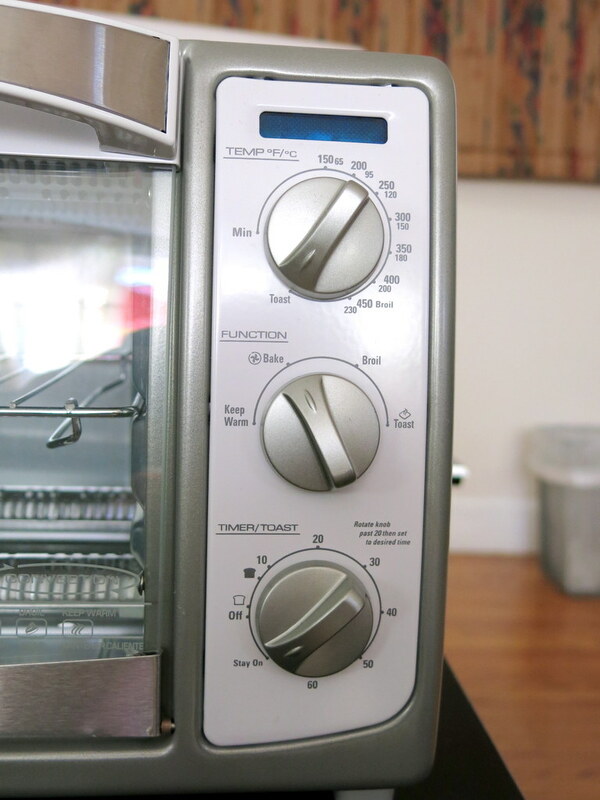 Also, I’d like an automatic way to open the oven door and blow air into the oven to accelerate the cooling time. For remote notification, I’ve decided to use an 433MHz RF transmitter to send signals to a remote power socket. I have a lamp connected to the power socket, and this way I will get notified when reflow is done. For faster cool-down time, I will use a servo tied to the oven door handle with a string — rotating the servo shaft can pull the door open. I will also put a second remote power socket connected to a circulation fan to blow air into the oven. 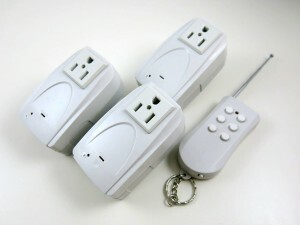 Since I am using remote power sockets anyways, I am going to throw in a third one for the oven. This way all power line devices are controlled by power sockets, so there is no messing around with cutting cables etc. If you want better reliability, you can certainly use a relay or an SSR. I just decided to go with RF power sockets for the convenience. 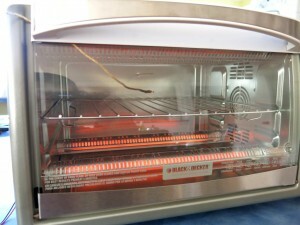 Toaster oven (with convection fan for more even heating). Kitchen thermometer (you can also get similar ones from Target or Walmart). RF power sockets (set of three). RF transmitter and receiver pair. 2.32K 1% resistor (any value between 2.2K to 10K is fine. 5% is ok but 1% is better). 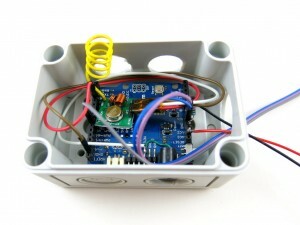 5V servo, such as this one. I have an existing set of RF power sockets and I don’t remember where I got them. But the link provided above looks similar, so they should work fine. A quick note: there are cheaper RF power sockets which only support toggling, but I would suggest getting the type that has separate on/off buttons for each channel, because you can know for sure whether the socket is on or off. Also, there are some types which work in the 315MHz frequency band. In this case, you need to get 315MHz RF transmitter instead of 433MHz. 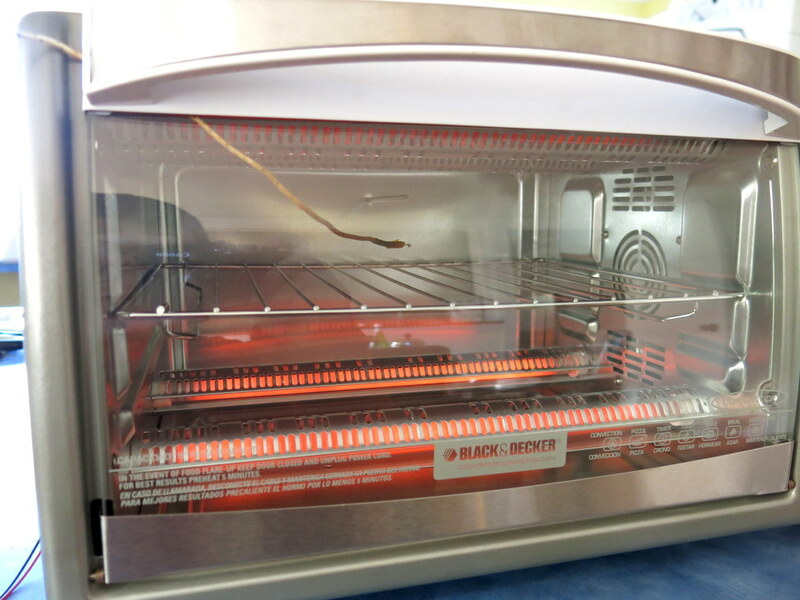 The reflow oven is a temperature-controlled device, so the first thing to do is to have the microcontroller sense temperature. 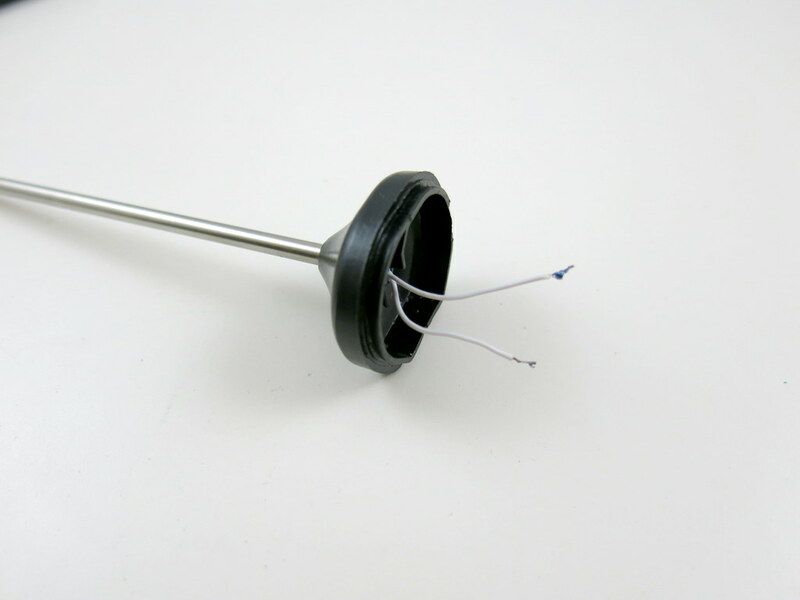 The cheap kitchen thermometer is perfect for this: it has a thermistor (i.e. temperature-sensitive resistor) wrapped around a metal probe. 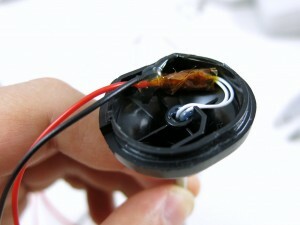 Just open the thermometer, desolder the two wires, and extend the wire length by soldering two pieces of longer wires. I also used some hot glue to fix the joints so they they won’t move around and break. 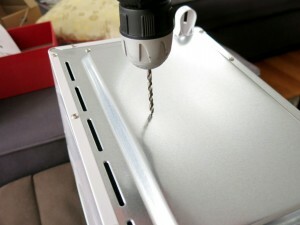 Next, measure the diameter of the temperature probe (mine is about 0.147″), and at the back of the toaster oven drill a hole that’s slightly bigger (I used 5/32 drill) than the probe size. 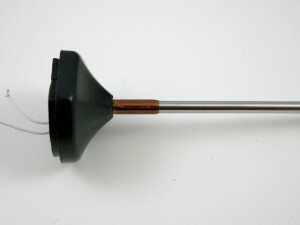 The hole should be located at roughly a quarter to one-third on the height, so that when the probe is plugged in it would neither touch the top heating element nor the tray. Next, wrap a layer of Kapton tape around the temperature probe, and insert it through the hole, so that it stays tight in place. 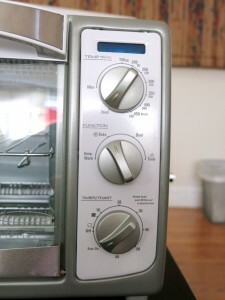 The oven should be set to the highest temperature, convection, and stay on. This way we can bypass the oven’s internal control mechanism and instead use the microcontroller to turn heating on and off. 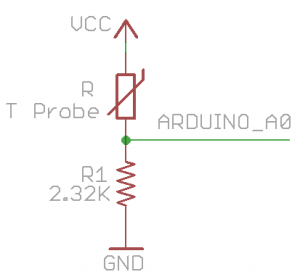 For the microcontroller to sense temperature, just use the 2.32K resistor to form a voltage divider with the thermistor (i.e. probe). See the schematic on the right below. 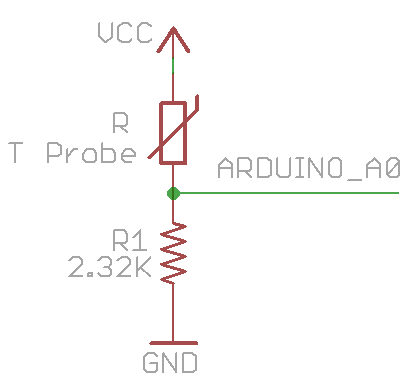 The divided voltage is connected to Arduino’s analog pin A0 for reading. The next step is to perform temperature calibration. 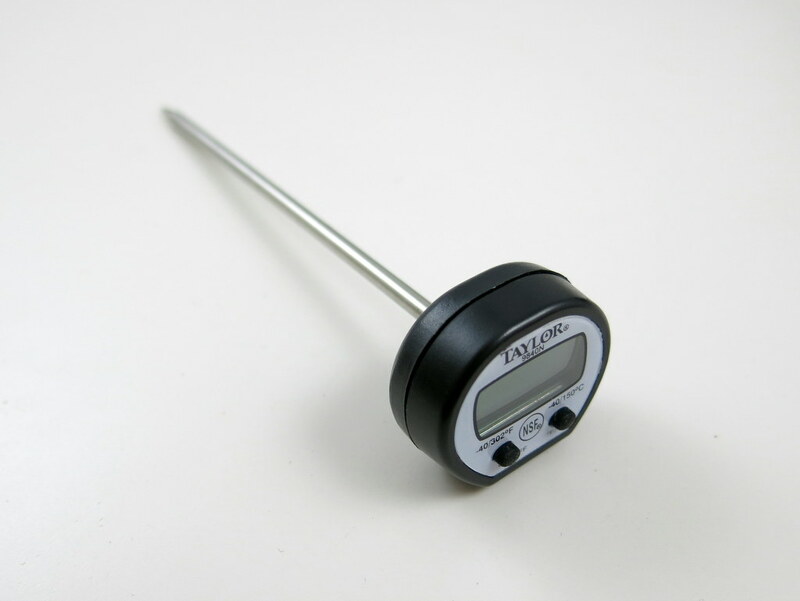 If you’ve got the same kitchen thermometer and 2.32K resistor as I have, you can skip this step. But if you have a different set, you need to perform a calibration step to find out the relationship between the actual temperature with the analog reading. To do so, I used an existing digital thermometer (my EX330 multimeter) to serve as reference. 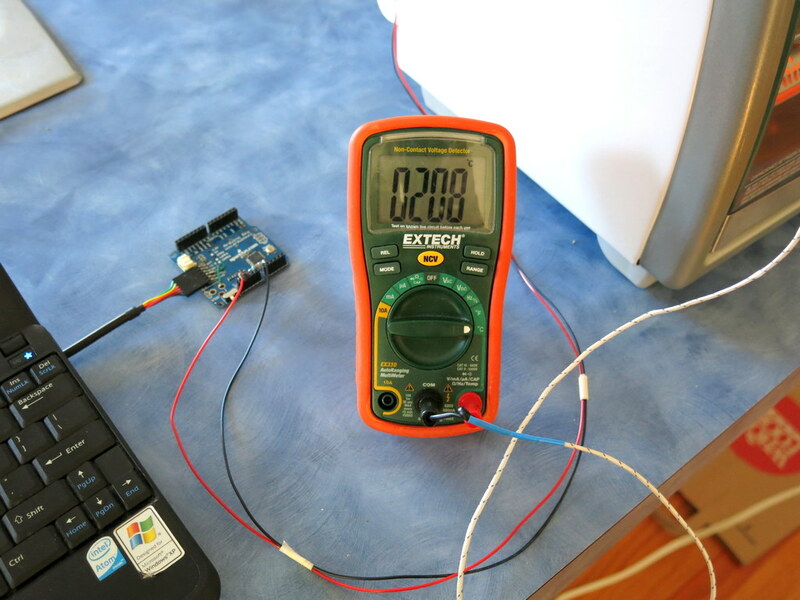 Insert its temperature probe to the oven and get the tip close to the center; then I wrote a simple Arduino program to print out analog values from A0 once every second. Turn on the oven to let it heat up. The temperature will rise, and the analog reading also rises. When it reaches about 210°C (Celsius), turn off the oven, and record the analog reading. 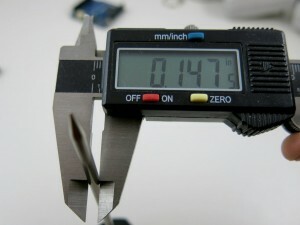 Then do another reading when the temperature drops to about 170°C, and the last one when it drops to about 80°C. Basically 210°C is when we should stop heating (the temperature will climb up a little more beyond 210), 170°C is when the oven door will open and the fan will kick in, and 80°C is when the reflow is considered finished. My readings corresponding to these three temperature values are roughly 830, 790, and 360. 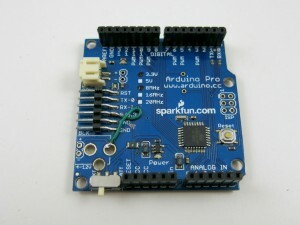 These will be used in the Arduino program later. Next is a fun step. I built a oven door opener using a servo. 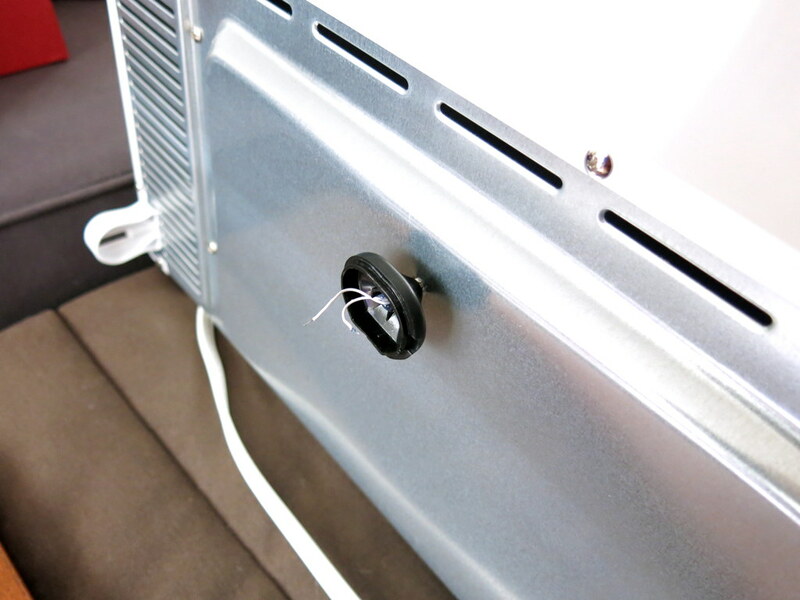 The basic idea is to attach a piece of string between the servo and the oven door handle. Rotating the servo shaft will be able to pull the door open. To do so, I picked up some pieces of wood from HomeDepot and build a wooden frame. To make the whole assembly stable, the base of the frame should be sufficiently heavy. 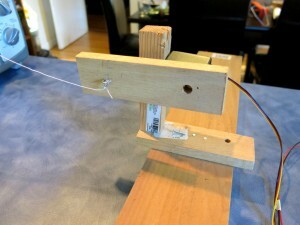 Then I secured the servo to the frame using some long #4 screws and nuts. 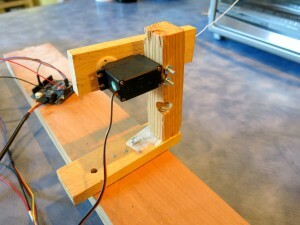 Since the servo doesn’t come with a long shaft, I used a small piece of wood and attached it to the servo gear. This can extend the sweeping distance of the servo. Be careful not to make it too long though, otherwise you may overdrive the servo’s torque. 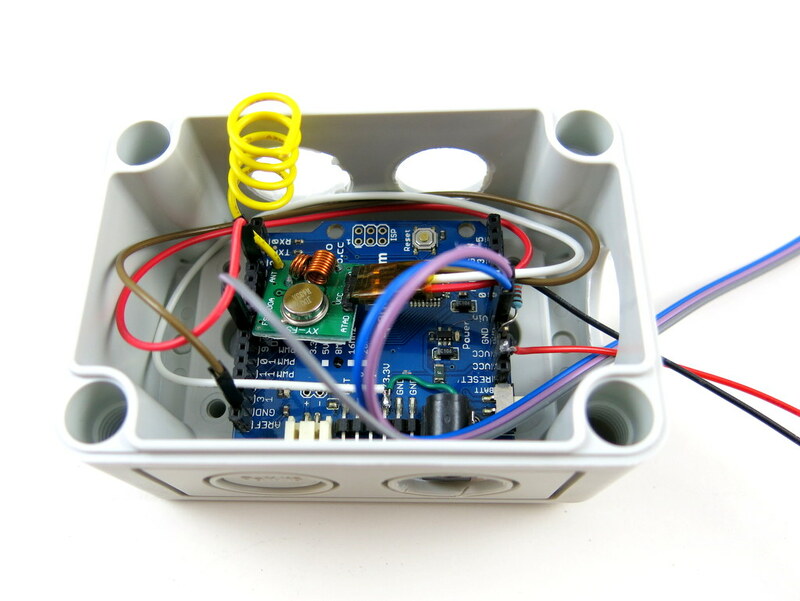 The video below shows the servo in action. 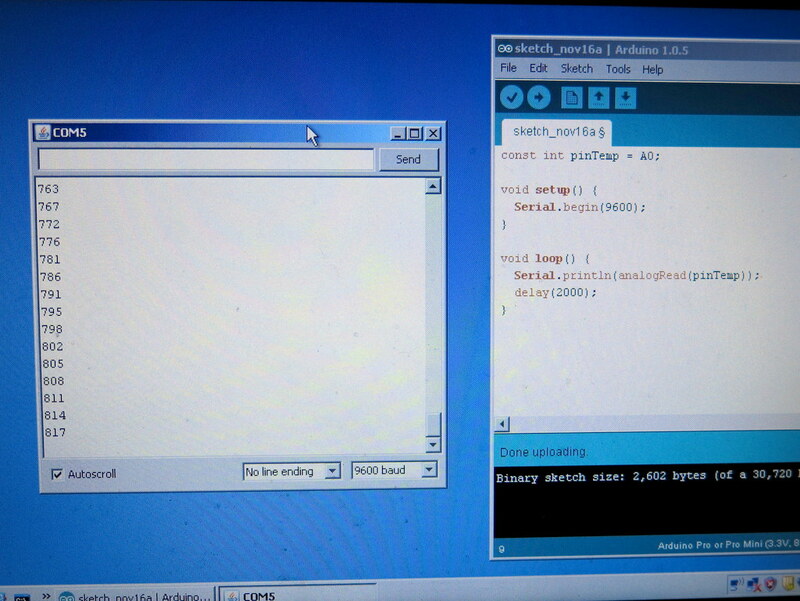 This is using Arduino’s built-in Servo example called Sweep. The servo’s three pins are connected to 5V, pin D9, and ground. 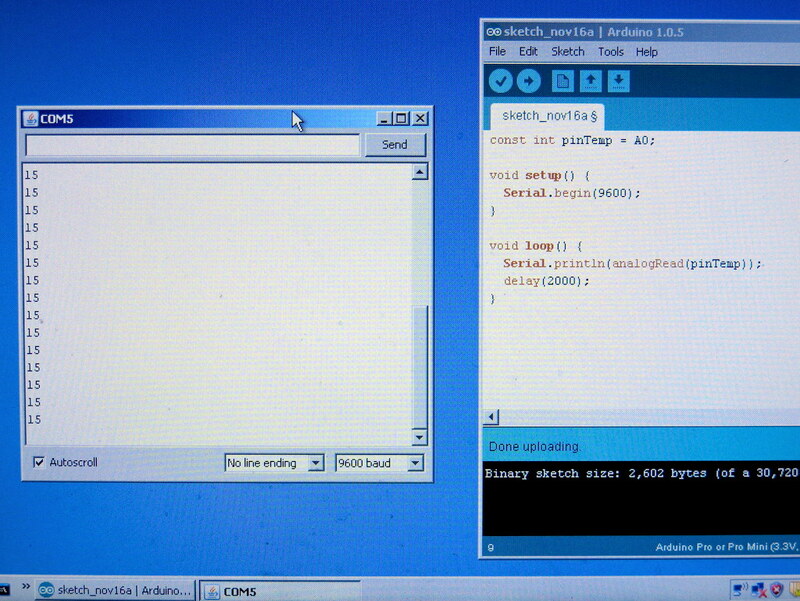 Channel 1 on: 010101010011000101000011; off: 010101010011000101000000. 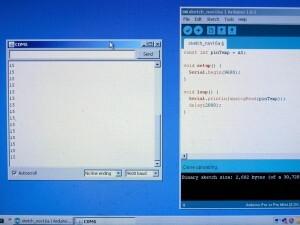 Channel 2 on: 010101011100000101001100; off: 010101011100000101000000. Channel 3 on: 010101010000110101110000; off: 010101010000110101000000. 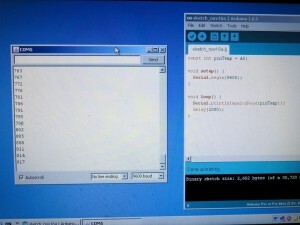 Once the patterns are figured out, I can then connect a 433MHz transmitter to Arduino to simulate the remote control. This way I can reliably turn on and off each socket individually. With the capability of opening oven doors and blow air into it, the cool-down time is significantly faster. The total reflow time is about 6 minutes now, which is a lot better than 15 minutes before. 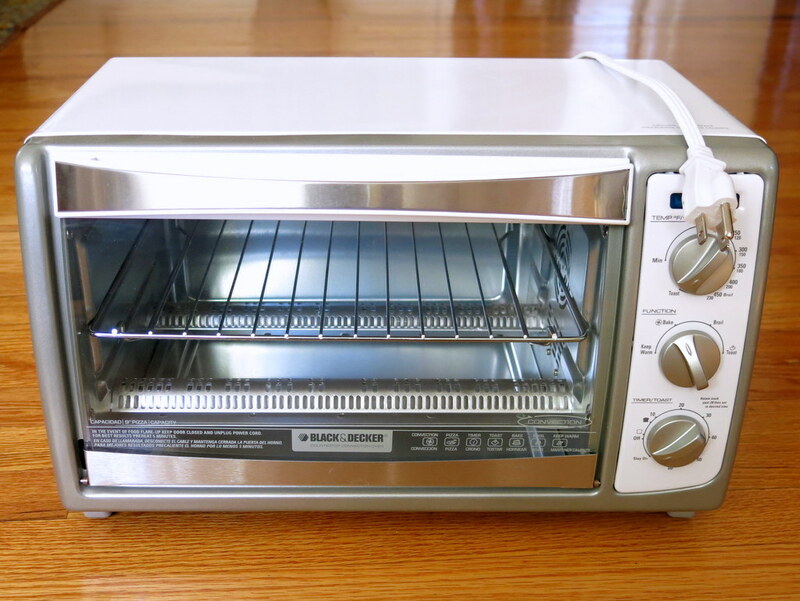 That’s it, my reflow toaster oven with bells and whistles. 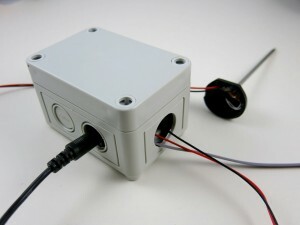 It can certainly be improved by adding PID control, The hardware cost, everything included, is about $120. It’s inexpensive and pretty easy to replicate. Much better than my professional reflow oven! Very cool! I’ve been planning to build a reflow oven and I’m going to use your project as my blueprint. Thanks! Great article Ray. I’m going to use your elegant design for my build. One thought, the Stanley sockets are only rated for 600W but the oven is rated at 1500W. Could this be a problem? Actually mine is rated 1500W (the Amazon webpage seems to show 600W, which is wrong I think). In any case, you can also find other RF sockets which are rated 1500W. I would like to see what changes are required to use a ssr instead of the rf method, is there a lot to change? SSR is much simpler. 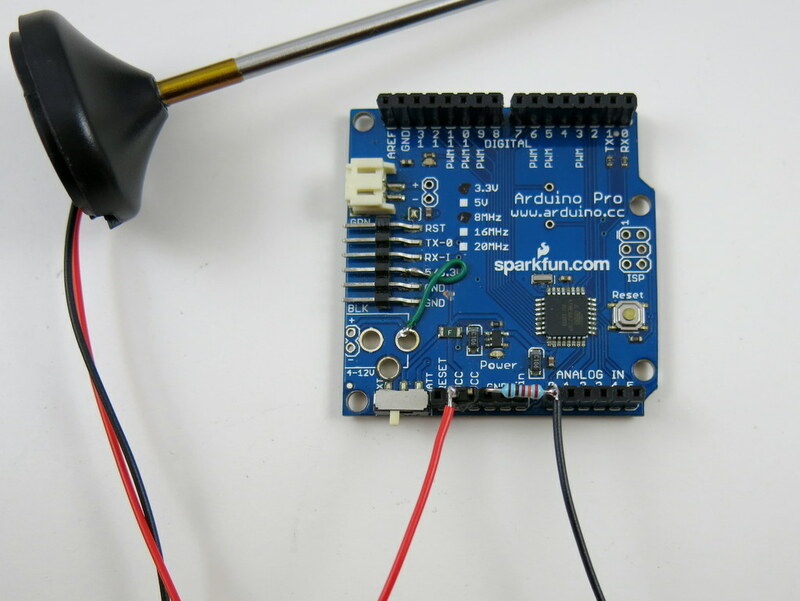 All you need is to replace the code that sends on/off signal to RF socket with digitalWrite to set the SSR signal pin to HIGH or LOW.